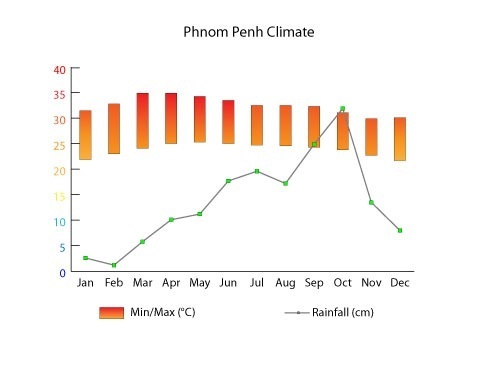 Phnom Penh’s climate is generally tropical; therefore, it tends to be hot year-round with minor variations. The average temperature is between 28 to 33 degrees celcius. In Phnom Penh, there are three basic seasons: the cool season from roughly November to January, the hot season from roughly February through May and the rainy season from roughly June through October. The rainy, monsoon season consists of varying amounts of rainfall. Most rain falls as showers; somtimes, it is difficult to appreciate all the sights in and around the city as the rain is intense and many streets are flooded and muddy. Thankfully the showers pass quickly; but you might be unlucky and have a few days of continuous rain; but that is more likly to happen in May and September. The summer season especially between February and March is when the weather tends to get scorching hot with unbearable levels of humidity. If visiting at this time, it is necessary to keep well in the shade as much as possible, wear sun-screen and caps, and constantly carry a bottle of water. The heat can be very unforgiving especially for those unaccustomed to this kind of climate. Note that most hotels and restaurants are well-cooled, either with air conditioning or with fans. However, not all public or private transportation is so accommodating. The best time to visit is in the winter, between December and January. During this time, the temperature is cooler but it is still hot and tropical.30-32oC is quite common; but its less humid so more confortable; especialy in the evenings.